Pupils from Bailey’s Court Primary School in Bradley Stoke took part in bike rides to Bradley Stoke Community School and Abbeywood Secondary School on Monday 15 June to help them learn the cycle routes ahead of the transition to secondary education in September. Transition rides aim to build confidence and improve riding skills so pupils can travel independently to school. The rides are for pupils who have achieved their Bikeability cycle proficiency level 2 and are led by accredited Bikeability instructors. As part of the ride the pupils are shown where to secure their bike and safety gear at the new school so there are no big surprises on the first day of term. 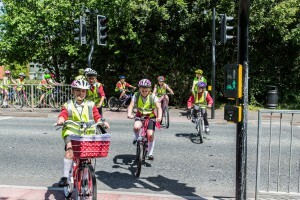 In total 65 pupils from seven South Gloucestershire junior/primary schools including Bailey’s Court, Bowsland Green, Meadowbrook, Raysfield, St Michael’s, Stoke Lodge and The Ridge will be taking part in transition rides to their new secondary school. Transition rides have been funded by the Local Sustainable Transport Fund Active Travel to school project.